Home→Mods, Tech Talk & Tips→Projects & Mods→Warning: External TPMS Sensors Could Ruin Your Towed Vehicle Valve Stems! 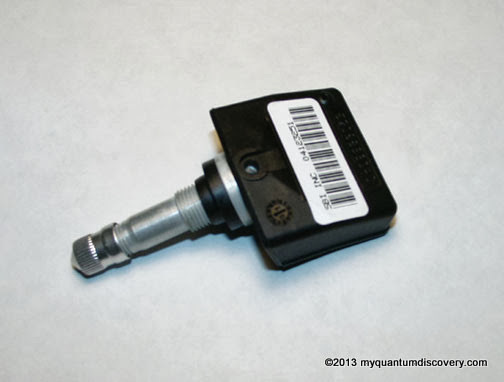 Warning: External TPMS Sensors Could Ruin Your Towed Vehicle Valve Stems! All automobiles in the US since 2008 are federally mandated to have a Tire Pressure Monitoring System (TPMS) and some vehicles had them as early as 1997. If you also have an aftermarket TPMS for your coach and monitor the pressure in your towed vehicle tires via thread on external sensors, there is a strong possibility of irreparable damage to both the external coach TPMS sensors as well as your toad valve stems and its internal TPMS. In short, if you are using an aftermarket TPMS with thread on sensors and your towed vehicle also has aluminum valve stems, you need to read on. 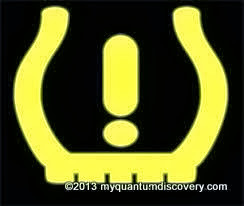 The TPMS on your towed vehicle lights up a warning on the dash should one or more of your tires lose pressure. This is intended as a safety measure to reduce the incidence of fatalities due to under inflated tires. One type of automobile TPMS system employs aluminum valve stems – and herein lies the root of the issue and the target audience for this post – so take a look at your towed vehicle valve stems to see if you are at risk. 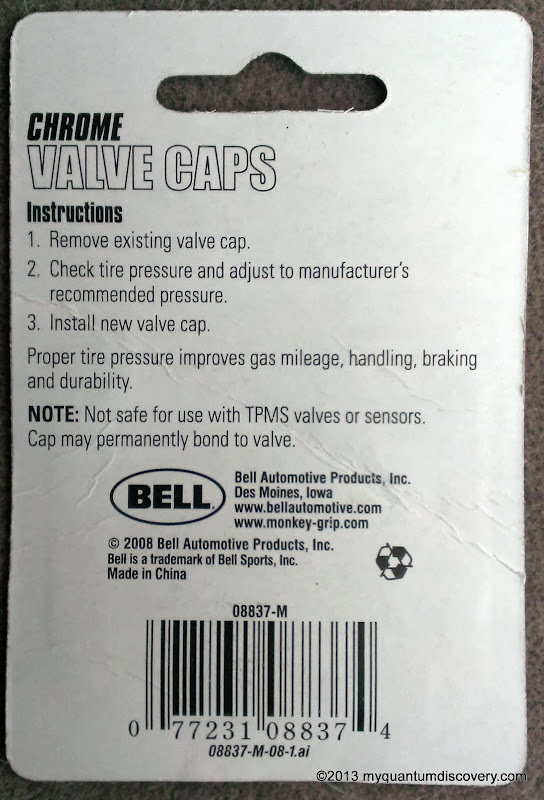 Other variations of automotive TPMS, both “direct” and “indirect” employ rubber valve stems with brass components and are not affected by the incompatibility described below. In regard to a typical motorhome/coach, due to its weight and size it is equally important to know if any of those 6 or 8 tires lose pressure suddenly, have low (or high) pressure, or an abnormally high temperature. Most coaches currently do not come with TPMS built-in, therefore many of us have, or are planning to add, an aftermarket TPMS system to do the job. The majority of aftermarket truck/RV TPMS systems incorporate sensors that simply screw on to the valve stem in place of the valve stem cap and report pressure & temperature to a display at the driver console. This is actually much more comprehensive than the typical automotive system because it not only tells you about a problem, it tells you exactly what the problem is and for which tire, meanwhile giving you a full time readout of pressure and temperature for all the tires. Many automobile TPMS systems just turn on a dash warning and leave it up to you to figure out whats wrong. 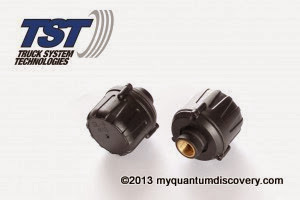 Most of the aftermarket RV TPMS systems are designed for the trucking industry and can support 22 or more sensors, so many motor coach drivers use this capacity to monitor the tires on both their coach and towed vehicle for additional peace of mind. This is easily achieved just by adding four more sensors to your coach system and simply screwing them on to the towed vehicle valve stems. Easy enough, right? But there is a potential incompatibility between the sensors and your towed vehicle: there is a good chance a towed vehicle with factory TPMS will have aluminum valve stems, but the threaded inserts on your coach based TPMS sensors are likely brass. Hmm. Well what’s wrong with that? Brass, Aluminum, both corrosion resistant metals, right? True, but not when they come in contact with each other and especially when they are subject to moisture and contamination (like road salt). The phenomenon is called galvanic corrosion, a process where one metal will give up electrons to the other metal. The net result is that over time your $50 a pop coach TPMS sensors will weld themselves permanently to your towed vehicles $200 a pop aluminum TPMS valve stems. I found this out the hard way – and I should know better because as TheVoltDoctor I work primarily on boats in a corrosive salt air and water environment and see this type of issue all the time albeit usually with stainless steel and aluminum and of course not with valve stems. 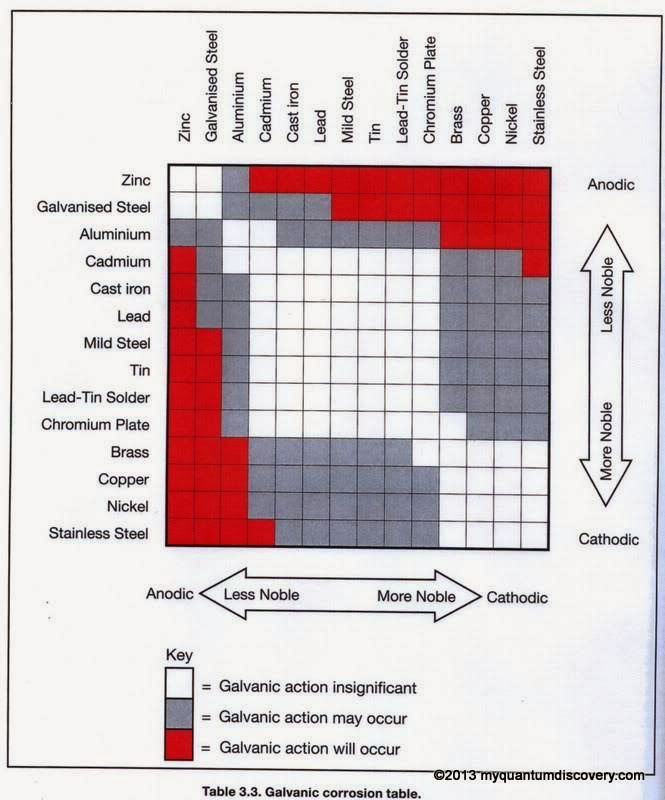 Take a look at the chart above but keep in mind that there are many alloys of each kind of metal and compatibility can also vary widely among the assorted alloys. On our coach we are using a TST 507rv Tire Monitor System with 12 sensors, 8 for the coach and 4 for the tow vehicle. It has been installed for almost two years and has worked flawlessly. This system has replaceable batteries in the sensors and when the coach dash console started giving low battery warnings it was time to replace them all. So I removed all the sensors on the coach, took them apart and replaced the battery and cap O-ring – a fairly easy process. Our diesel pusher coach (and I assume many others) has what appear to be stainless steel valve stems – I encountered no signs of advanced corrosion or difficulty removing the pressure sensors from the coach valve stems. 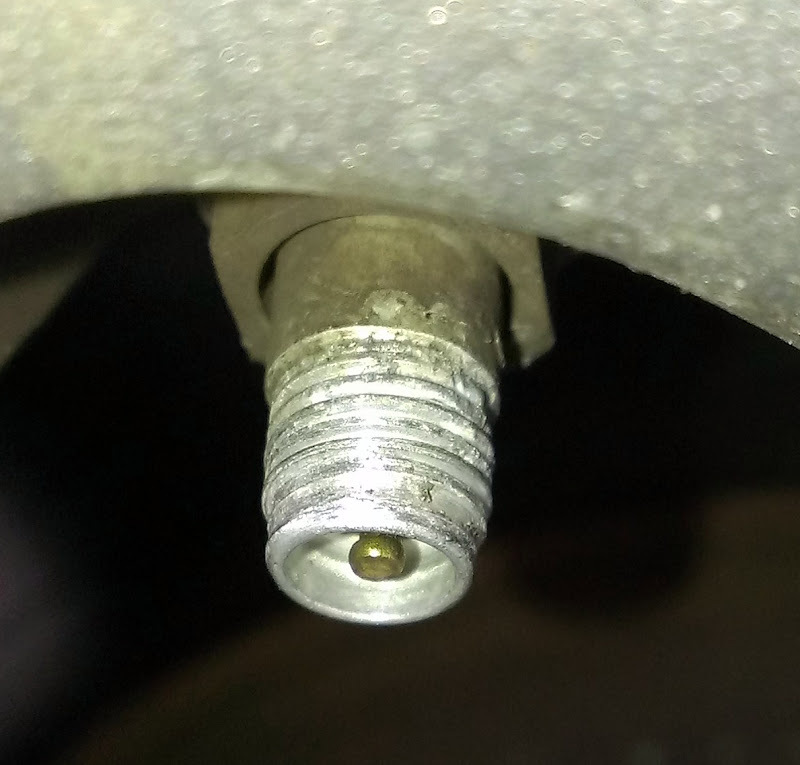 Next, I began removing the sensors on our 2007 Honda Odyssey tow vehicle which has the aluminum valve stems – two sensors came off OK, but with some resistance and there were some signs of damage to the valve stem threads (see photo left). Another came off with much more difficulty taking more of the valve stem thread with it (I have been unable to reuse this sensor due to the clogged threads). The last sensor started to loosen but then jammed – jammed so tightly the brass insert of the sensor separated from the plastic body and became hopelessly stuck! Now the toad tire was leaking air so there was no choice but to get out the Dremel and perform emergency surgery. After cutting away the electronics in the sensor I was left with the brass ferrule that had welded itself to the aluminum valve stem. With a Dremel cutting disc I carefully made a couple of cuts lengthwise on the brass ferrule while trying not to cut into the valve stem threads. I was able to pry off the brass pieces with a small screwdriver. Fortunately, while the valve stem was partially damaged, I was able to clean up the threads (with a valve stem repair tool) enough that a replacement stem was not needed – whew! Unfortunately the TST sensor was completely destroyed. Lesson learned. 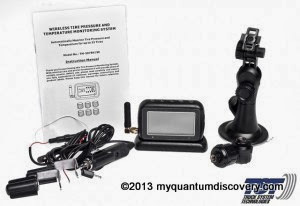 I contacted TST and they graciously sent me two new sensors free of charge – (wow!) I asked them if they had seen this problem before and they said it was unusual. Really? A little research on the web proves otherwise. Maybe unusual for trucks since the valve stems are not aluminum. Check out the info here or Google “TPMS corrosion”. Also take a look at the package (photo right) for these brass valve stem caps! Can’t be that rare if an ordinary package of valve stem caps caries a warning about the corrosion issue! So what’s the fix? TST swears that a tiny dab of dielectric (insulating) grease, will slow the corrosion enough to substantially reduce the issue. I have found this to be true but suggest removing the sensors at least every 6 months to clean and re-grease. Be sure to go light on the grease and don’t let any get in the sensor or valve stem. 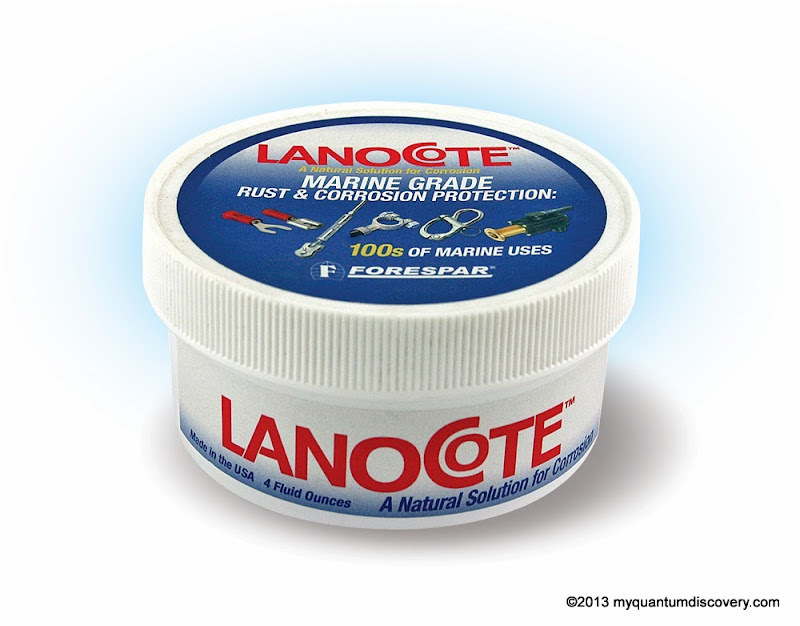 Lanocote Corrosion Control is one choice but there are many others. A more proper metallurgical solution as touted by industry experts, is to only use aluminum or nickel plated parts on your aluminum valve stems. Take a look into your sensor threads, if they are brass colored you are susceptible, but if they are silver colored they might be nickel plated and you should be safe. I suspect however that most aftermarket TPMS sensors out there do not have nickle plated threads. One workaround might be to use short nickel plated valve stem extensions between your aluminum valve stems and your brass threaded aftermarket sensors. But this is not an ideal solution and may make your valve stems and sensors more prone to physical damage. Note that the corrosion takes time to manifest so if you only install your toad sensors when towing and keep them off the vehicle otherwise, you may never see the problem. If you drive exclusively in areas of the country where the roads are never salted this will also slow down the corrosion process. Also never use aftermarket valve caps on your aluminum stems! (Unless they are plastic or aluminum). In summary, if you have aluminum valve stems on your towed vehicle and a coach TPMS system that uses sensors with brass threads, keep those threads greased! 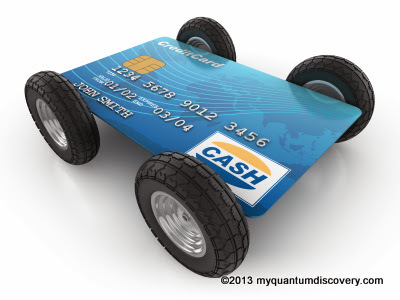 Hope this info can save you from incurring an expensive repair! My TireMinder TPMS System has already taken care of that. I have aluminum valve stems for my 2011 car and they have aluminum transmitters available for it. I’m glad they thought of that. I’ve had the system on my car for over 4 years with no problems and no need to “grease” my wheels or purchase something for it. The price is the same. Good to know thanks for the info! 1) the $5 tire valve kit at a chain auto parts store should include a tool with rethreading tap and die for all threaded tire valve parts. It isn’t hardened steel, but neither is a valve stem. 2) All inexpensive copper-tin-zinc alloys are susceptible to chloride contamination. There is a progressive zinc-chloride/zinc-oxide conversion that recycles the chlorine ion almost as a catalyst. There’s no way to stop it once it starts without an oxygen barrier, and dielectric grease is just a long chain dimethyl-siloxane oil and pure silica paste … good at excluding water, not an oxygen barrier. So to recap after the salt exposure is too late to fix it, dielectric grease won’t protect it from oxygen. Hi, sorry missed your comment somehow. 1) Yes that helped but a lot of the metal (aluminum) was gone. 2) Good info, so what would you recommend? Is what you described the same as the galvanic corrosion of dissimilar metals (which is what I thought was going on)? Not disputing your comment as it sounds like you sure know a heck of a lot more about the chemistry than I ever will, but I can say after 3 years of using the grease or anti-seize the problem has not recurred. Another comment on your excellent article is to not use the TST flow-through sensors on the towed vehicle. We had them on our Jeep and the rotational mass and/or additional weight of the sensor was enough to damage the rubber valve stem. TST replaced them with the regular sensors for us (talk about good C/S). BTW, on the regular sensors TST showed us how to remove the anti theft device so you don’t need to use the tool to air up the tires. Not a big deal, but sure is more convenient. Jim, good info on the flow thru sensors being too heavy for rubber stems! I didn’t realize they were that much heavier than the standard sensors. Yes, it didn’t take long for the anti-theft casings on my sensors to be removed either. Thanks for your contribution!